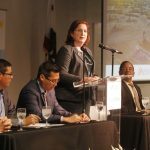 Aera Energy LLC was lauded by Kern County Board of Supervisors Chairman Mike Maggard during the State of Kern County for the company’s effort to build California’s largest solar energy project. Through a partnership with GlassPoint Solar, Aera will build an 850 megawatt solar thermal facility, which will generate 12 million barrels of steam per year. That steam will help with enhanced oil recovery at the Belridge field, one of the nation’s largest producing areas. The plant will also produce 26.5 megawatts of photovoltaic energy, which will help power the operations at the field. 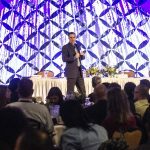 Maggard highlighted Aera’s efforts during a segment of his speech about private sector development and innovation during the sold-out event at the DoubleTree Hotel in Bakersfield.